The RadRichTextBox is capable of displaying tables. To add a table to the document you can use the provided API. The tables inside the RadRichTextBox are constructed using the Table, TableRow and TableCell classes. The defining of a table is very similar to the one in HTML. The Table class define the table itself and it accepts TableRow objects as children. The TableRow on its hand accepts TableCell objects as children. The TableCell accepts Block elements as children, so to specify its contents of a cell use such one (e.g. a Paragraph) to wrap it. Fixed - specifies that the table should have width equal to the value of its PrefferedWidth property. AutoFit - specifies that the table should fit into the entire space available. This means that the table will get stretched horizontally. To learn more about the Formatting API of the RadRichTextBox , read this topic. 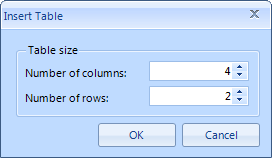 InsertTableColumn - inserts a column at the end..
You can use the InsertTableDialog, which comes out of the box. To show it upon a user action just call the ShowInsertTableDialog() method of the RadRichTextBox. Here is a snapshot of it. The RadRichTextBoxUI also uses this dialog. To learn more about the Formatting API of the RadRichTextBox, read this topic. ChangeTableCellBorders - modifies the borders of the currently selected table via a __TableCellBorders__object.